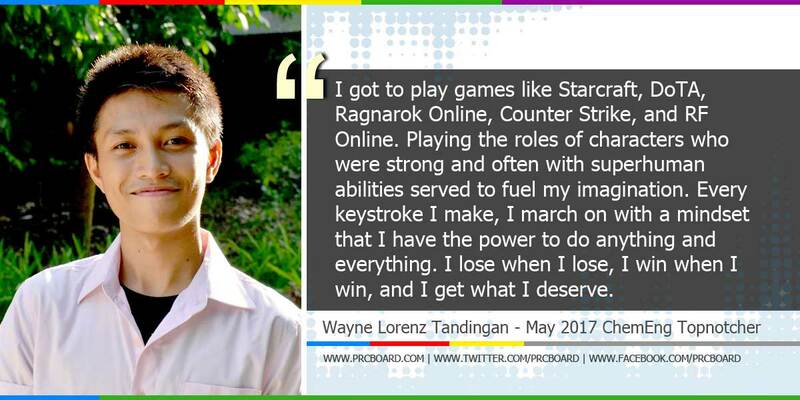 Be inspired with the inspirational story of Wayne Lorenz B. Tandingan from University of San Carlos (USC) in Cebu. Tandingan ranked first in May 2017 Chemical Engineering (ChemEng) board exam. Here is his story. You’ll find me sleeping while others burn their night candles to work. You’ll find me browsing a Wikipedia articles about time crystals while my peers are worrying over exams. You’ll find me spending precious minutes in the toilet while others are rushing to come early to class. You’ll find me playing computer games all night long while the rest of the world is taking a break from the toil they had under the heat of the sun. That’s right. I don’t have a tear-jerking story to tell. Self-acceptance is what defined my academic journey. I was born to a family of five and I am the youngest in my family. My parents work as teachers. We were neither rich nor poor but we lived a very stable life. We rarely worried about what to eat for dinner but neither did we spend our idle time wondering what expensive gadgets to buy or what country to visit for our next vacation. It is because of this very stable life and my position as the youngest sibling that I had room to explore the world. I was introduced to a complete set of encyclopedias at a young age. I’d borrow books about everything and anything, whether it was a guide to origami, a book about inventions that changed the world, an encyclopedia of bodybuilding by Arnold Schwarzenegger, or a textbook about something as sophisticated as human physiology or genetic engineering. I don’t really understand the text of course but I liked looking at the pictures. It was because of this exposure that I fell in love with science. There was more to everything than meets the eye and I was eager to discover. In addition to having a large knowledge base, our home had a couple of computers where my brother and I got to play games like Starcraft, DoTA, Ragnarok Online, Counter Strike, and RF Online. Playing the roles of characters who were strong and often with superhuman abilities served to fuel my imagination. Every keystroke I make, I march on with a mindset that I have the power to do anything and everything. These fantasy worlds generated by computer code and powered by pure logic also gave me a perspective of the real world that I learned to embrace: I lose when I lose, I win when I win, and I get what I deserve. These were perfect soil to grow a stereotypical nerd. I was intellectually gifted so there was an opportunity to push me to become a go-getter. Cultivated in a vacuum and made to work solely for academic achievements, I became socially awkward, I had niche interests, solace was a frequent visitor, and I was constantly bullied. I tied my self-esteem to the grades I get and the number of certificates I received from extracurricular activities. I had a lot of accomplishments but life always find a way to make a trade-off. For sure I got a lot of rewards and medals but I felt empty and I had so many embarrassing experiences that I still don’t like to recall until now. I hated that life. I hated being lonely at the peak of the mountain so I was strongly determined to abandon this achiever life in college and enjoy my college life like a normal person. My interests lay in the natural sciences so I would have loved to take up a triple major in biology, chemistry, and physics (which, looking back, is a bit contradictory considering that I wanted a “normal” college life). However, my ambitions were limited to the capacity I had so I took up chemical engineering. An engineering course will help me get a stable and well-paying job anyway, I thought to myself. I tried enjoying the normal life: going to internet cafes on breaks to play computer games, trying out alcohol, staying out late, and occasionally skipping class for the sole reason that I don’t want to go. I no longer took a lot of notes and I was no longer determined to engage in a lot of extracurricular activities. To accommodate that, I adopted a style where I study only the essential elements of a subject. When I do projects I kept content minimal and straight to the point. I did not memorize all equations – in exams I simply derived those that I did not remember. I can write my solutions to problems on any piece of paper I can find. I followed the advice my teacher gave me: the very least I should remember about anything is where to look it up. When I learn a concept, I try to distill it so that I can easily explain it to anyone. My study style revolved on being efficient and the driving force was simple – I wanted to have time for other things I wanted to enjoy or learn. While doing these I follow my own code of honor: I should never betray what I know, what I don’t know, and what I can know. It meant doing my best to not cheat. It meant doing the extra mile to ask the harder questions. It meant making every solution, every single word on a written report, every data presented make sense. It meant that I have do more than just passing the test or submitting the report. It meant that I own my work and my work should have meaning. I gave in to the trend of working hard. I did pass all my subjects but I hated how I did it. I hated the part where I had to study this and that just for the sake of passing the exam. I hated the part where I was constrained only to the sources I was obliged to read. I hated the part where I had to worry about the number of pages of my reports. I hated the part where I was forced to ditch playing computer games. I hated the part where is always a better way out there yet I had to choose the harder way so that I will look like I almost died while doing it. However, most of all, I hated that from the very start no one recognized the real hard work I made all along before – the enormous and rapid thinking made in silence and the effort I made to stick to my code of honor. In high school, I was disliked for who I was, I hated who I was, and then I changed. In college, I was disliked for how I worked, I hated how I worked, and now I don’t want to keep hating myself anymore. After I graduated from college, I resolved to be who I wanted to be and do how I do things best. I resolved to accept that I am the imaginative nerd who loves to learn about almost anything and everything. I resolved to be the person who, in the words of my girlfriend, “does things intensely.” I resolved to accept that I will always be different, that I will face conflict just for existing, but I have to walk tall and stand strong. My preparations for the board exam were in line with what I promised for myself. I learned at my own pace. I did not have a study schedule and I was often absent from review classes but my focus was strong whenever I commit to study or listen to review lecture. I went to the gym once a week to strengthen my body. I learned to extrapolate ideas using what I know when faced with new problems. I took pains to keep asking “why?” about my lessons until I tire myself. When textbooks and reviewers were insufficient, Mr. Google was my friend. I incorporated problem-solving techniques I learned from my review to my skillset. It helped a lot that I was genuinely interested in going beyond what was required for the sake of curiosity. As the exam came, I made a recount of the things I know and the things I don’t know and I steeled myself against the immense pressure of having to maintain USC’s 100% passing rate as well as having to meet expectations from my family and friends. Besides those, the things that I had to prove weighed heavily on my mind. I did not sleep well the night before the first day of the exam. Every time I think about the exam, a painful wave of nervousness spreads from my chest to my whole body. The physical and mental exercises thankfully paid off as my mind and body relaxed themselves when I saw the exam questions. All thoughts about my motivations went out of the window and my body was ready to take on six to eight hours of sitting. I was not relaxed because I knew I could answer all the questions. I was relaxed because I knew which ones I could handle and which ones I could not. I hand over my answer sheet as soon as I finish so that I will not be betrayed by moments of indecisiveness. The results of the May 2017 Chemical Engineering licensure exam is the culmination of the things I did to realize my resolutions. While I showed you my internal struggle I was facing, rest assured that I did not live a totally miserable life. Along the course of my academic journey I’ve made very good friends. I belonged to an organization whose members supported each other’s academic endeavors. With my brother and sister getting jobs, my family was able to travel to places and our little home has grown. I’m lucky to have a very understanding and supportive girlfriend whom I shared a lot of happy moments with. Most of all I owe it all to God who answered my prayer to make things okay in the end. If you are reading this and you face a similar endeavor like the licensure exam, it might help if you try to get to know yourself and how you work. Most probably your success will come when you do the things you do best the way you best do things. When you set yourself to do something, whether it is studying, traveling, partying, or resting at home, the least that you can do is to do it right. The best thing that can happen to you when you own who you are and what you do is that you do succeed, you have written your very own success story.